•Black walnut was believed to be a tree of ill omen. It was said to draw lightning and be associated with the devil. Its bark and nuts could stain the hands and skin permanently. The reputation of black walnut so bad that it was believed if any part of the boat, no matter how small, was made of this wood, trouble would follow. Even a single walnut brought abroad by a squirrel could bring disaster. •Laying the keel in a north-south direction - Custom demanded the keel be laid in a north-south direction, whenever possible. In this instance, folklore served a useful purpose. In doing so, the sun would affect both sides of the ship more evenly than if the vessel were laid in an east-west direction. •Figureheads were believed to be possessed of protective qualities that could shield the vessel, those aboard and its cargo from harm. 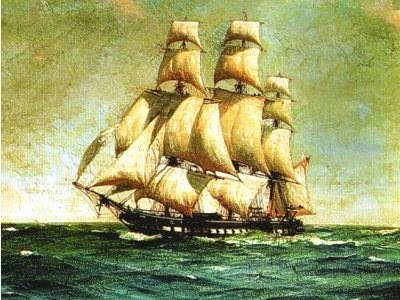 Each vessel was known to have its own personality and peculiarities, a uniqueness in the way she handled and moved and the internal noises she made while at sea. Captain and crew came to look upon her as almost human, and a figurehead gave her "eyes," allowing the vessel to look out trouble. •Paint - Painting a vessel the color or the sea (green or blue) was thought to bring bad luck. •Name - Great pains were taken in the naming of vessel, with care given not choose one that could be considered impressive. A humble name was more likely to pass unnoticed by the elements, whereas a haughty one could land the vessel in trouble, lest as the Bible says, the mighty be brought low. •The Launch – The most crucial moment in a vessel's development was the launch. It was in the launch that owners would discover whether they had purchased a lucky or an unlucky vessel. They watched for the way she performed and floated once released into the water. Great effort was made to ensure a successful launch. Mornings were considered a fortunate time of day, while Fridays and the first day of the month were to be avoided. Sightings of gulls, fish and porpoises on the appointed day were all positive signs. Launchings were a community affair with music, food and drink, and a Christian blessing. Special attention was given to selecting a person to christen the vessel with her name. 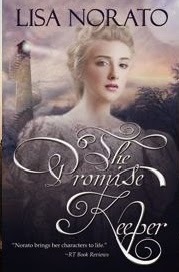 Lisa Norato is the author of the federal era novels, The Promise Keeper and Prize of My Heart, based in the shipbuilding center of Duxbury, Massachusetts. Very interesting post. Wonder if some of these superstitions are followed today? Thank you, Tina, and blessings to you! Looks like Deb answered your question for both of us below. Seafarers haven't changed; they're still superstitious. Thanks for visiting with me today! Thank you for this article, Lisa. You've added to my sea-lore. We ran into one of these superstitions while re-stepping our mast on our sailboat. The man operating the crane refused to replace it on deck unless we put a coin under it. And yes, we did christen our boat, but because of tradition, not superstition. Hi Deb! and thanks for sharing your story. That is so interesting! I haven't heard of putting a coin under a mast before. Hmm, I wonder what the history is behind that superstition. Safe voyage on your travels in your sailboat this summer. Blessings! I really liked your post about Shipbuilding Superstions. I have often wondered what it would be like to sail aboard one of these majestic vessels. Thank you again for your informative and interesting post! Thanks for reading, MammaG. So glad you enjoyed the post! I think a lot of us wonder the same as you - what must it have been like to sail on one of these great wooden ships. I live by the Great Lakes and you never see a blue or green Great Lakes Freighter either. We occasionally see a "salty" in those colors, but never the Lakes Freighters. Thanks for sharing, Pegg! Wow, proof these superstitions still hold today. Fascinating!